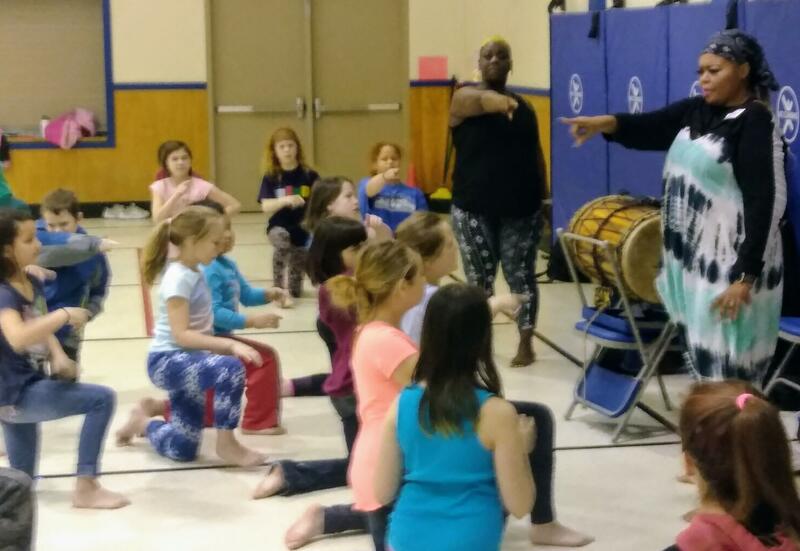 Elementary students at Kaleidoscope in Kenai are learning African dances and songs this week from Anchorage-based Sankofa Dance Theater. Tolerance and understanding of different cultures can at times seem to be in short supply, especially in such highly partisan times as these. But a dance ensemble from Anchorage is working to change that with a weeklong program at Kaleidoscope School of Arts and Science in Kenai that’s bringing culture to the kids through music and dance. Elementary classes at Kaleidoscope were taking turns in the gym Tuesday morning, learning dance moves and songs in Swahili. Their teachers this week are from the Sankofa Dance Theatre in Anchorage, who are visiting as artists in residence. But this is more than simply a demonstration. This is a cultural experience. Kasha Smith-Poynter is Sankofa’s managing director and principle dancer and she’s been sharing African culture through dance for years. She says it’s one of the best ways to foster a broader sense of community between cultures. The whole idea is to take away some of the mystery of a different culture. In doing so, Smith Poynter says when kids are older and see bias and discrimination in the world, they’ll have some tools to challenge it. “Before they get out in the real world and get super jaded about things, and everything that’s political and everything that’s dividing us, we’re like ‘no, let’s eliminate that and have them go out into the real world with a positive energy and a sense of community. Alaska’s really, really cool because we do come together in a way that I don’t think you see anywhere else. So, it’s kinda easy,” she says with a laugh. Students will continue rehearsing throughout the week and bring it all together for a finale performance Friday afternoon.